Rain Fade is a serious challenge with the new Ka-Band systems. High Throughput Satellites (HTS) employing Ka-Band and Ku-Band services are demanding higher availability than ever before. 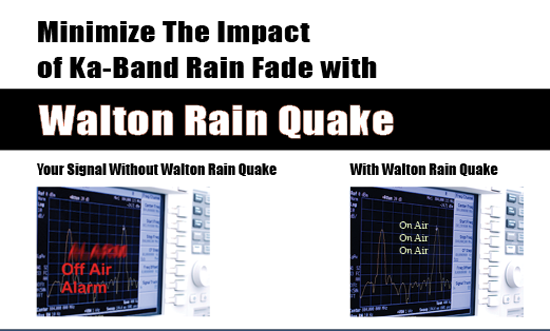 Walton Rain Quake systems reduce rain fade on your Ka-Band antennas, and protect your antenna G/T performance. During heavy rain conditions, Walton Rain Quake systems can reduce data loss — by over 20X compared to Ka-Band antennas without protection. • Prevents water from sheeting on your antenna surface - and causing Ka or Ku-band rain fade — from VSATs to large antennas. • Covers your antenna — keeping rain off with PTFE material that’s virtually invisible to RF. • Rain Quake is also the Ice Quake De-Icing System for year-round protection in areas with snow and ice. 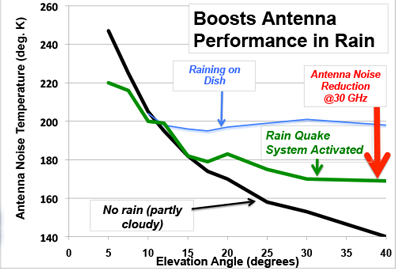 Tests show that the Rain Quake System helps to minimize bit error rates and antenna noise temperature increases, as well as increase your link margins during a rain storm.